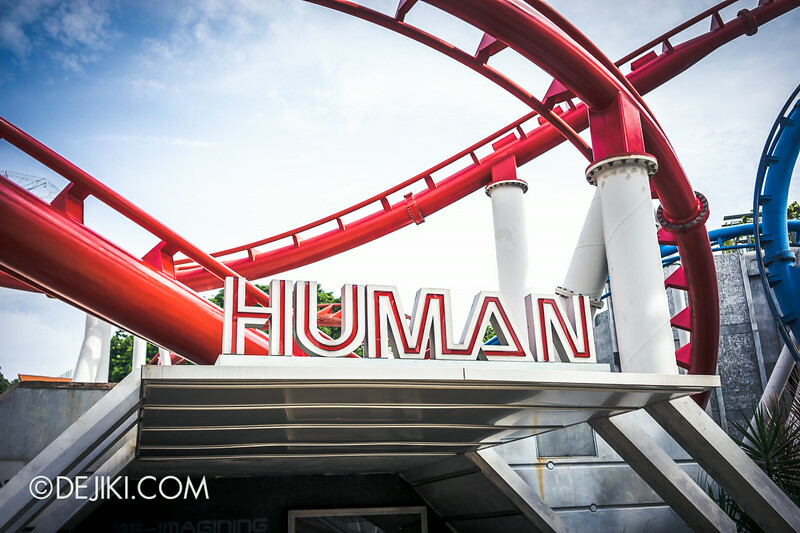 What’s hot this month: Halloween Horror Nights 4, Battlestar Galactica repair update, Transformers 4 at the park, and news about the park’s latest attraction! Halloween Horror Nights (HHN4) revealed, BSG update, Puss in Boots ride update, Monster Rock show to be replaced. Halloween Horror Nights 4 – The Minister of Evil, revealed! 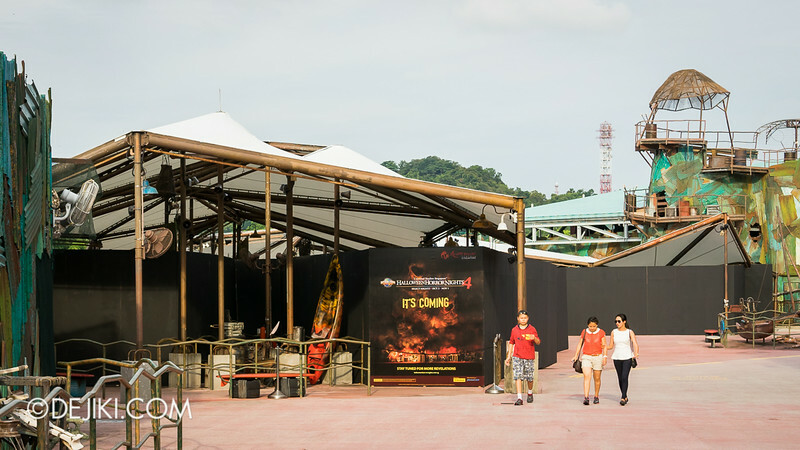 The curtain has finally lifted for Halloween Horror Nights 4 (HHN4) a few days ago, when Jonah Goodwill arrived at Universal Studios Singapore. The grand inauguration ceremony held at Pantages Hollywood Theatre took a turn for the worse when protesters emerged – even one tried to attack the new Minister. Goodwill swiftly subdued the protesters – with loud explosions and violent fires. He finally revealed his true identity as a demon, and HHN4’s Minister of Evil. On 24th July, I received these mysterious objects from the park. 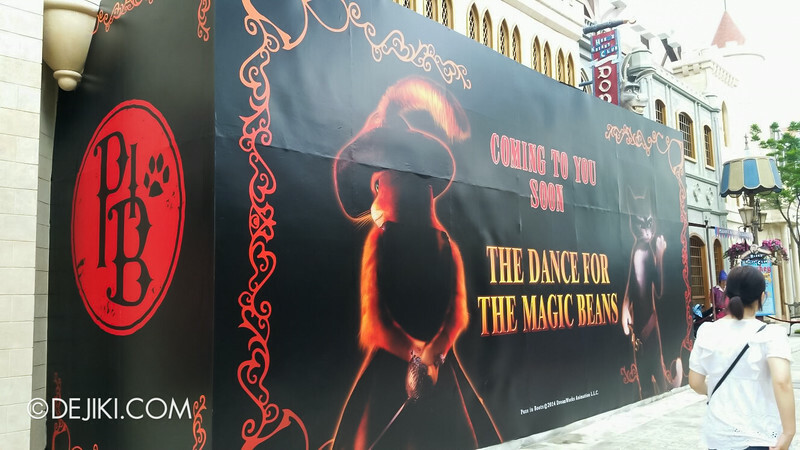 I guess… it should be the beans from the Puss in Boots film, which.. by extension, lends credibility to the theme of this new attraction. 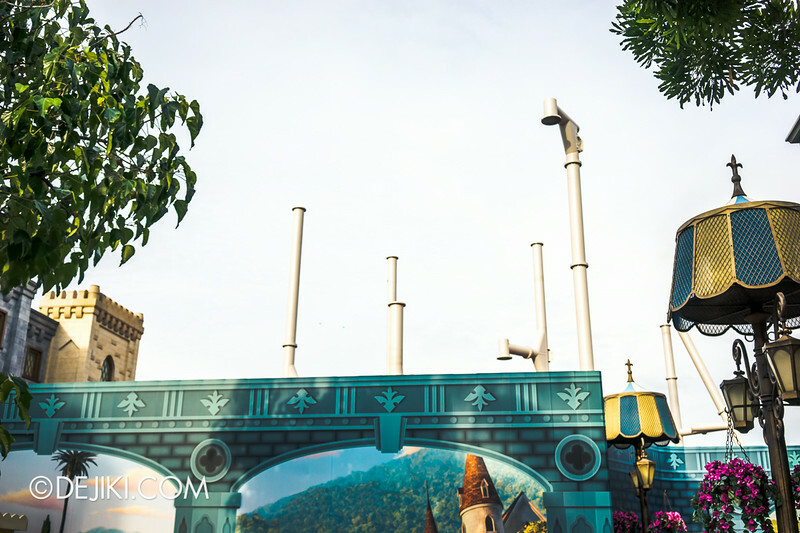 Yes, finally – the new ride at USS should be a Puss in Boots-themed rollercoaster. The name of the ride is Puss in Boots’ Giant Journey. There will also be a new stage show, called Dance Off for the Magic Beans, at Far Far Away. Kitty Softpaws will become the park’s newest Meet-and Greet-character! Construction is underway at Far Far Away for Puss and Kitty’s new show. The Dance Off for the Magic Beans could possibly share the same venue as Donkey Live. Back to Puss in Boots’ Giant Journey: If we assume that the magic beans are related to Jack’s Beanstalk, then it would fit with the ride’s green tracks. And that spiral lifthill. Good way to tie in with the story. Viewed along Romeo Drive. The spiral track is building up rather nicely. At this stage, the ride no longer has the typical Zamperla Volare layout. I hope to be surprised by this ride’s vehicles. 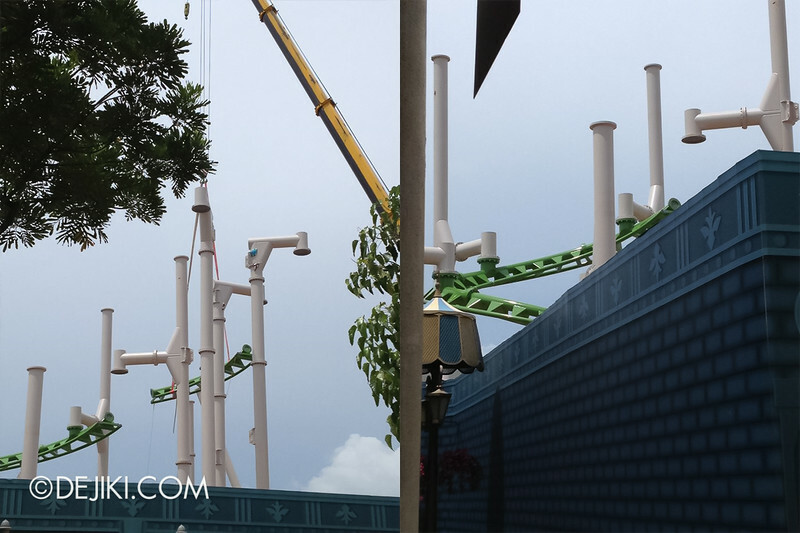 It appears that not all the pieces have arrived, but the park is in a hurry to complete the track layout. 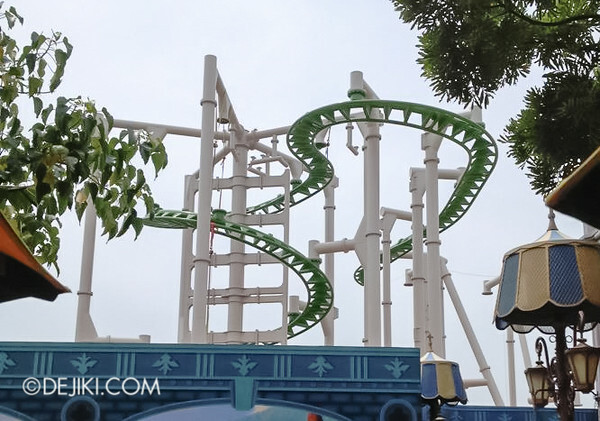 Notice how some of the green tracks are not actually connected to the white supports yet? A view from the bridge linking Far Far Away to Jurassic Park. The pace of construction is rather rapid. These are strong signs that the park is planning to open the new Far Far Away extension and its Puss in Boots-themed roller coaster within the next 6-8 months. Some mysterious red boxes that were added last month to the red (HUMAN) track of BSG. 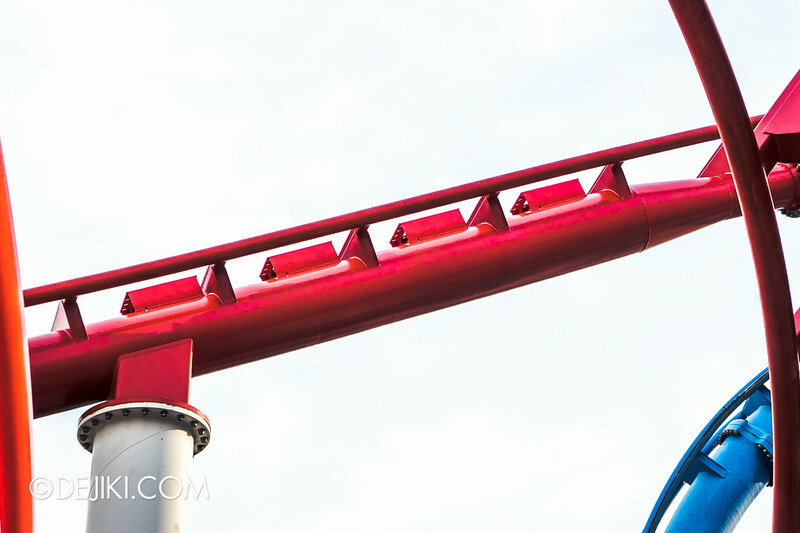 These could possibly be trim brakes to regulate the speed of the HUMAN (Red) roller coaster trains. Some work lights have popped up at the back of the park, facing the final banked turn section of BSG: Human. Also, there is some hearsay that the trains of BSG may be modified with some seats removed. The original trains are configured with 8 rows, with 4 seats in a row. Possibilities include having less seats in a row (like 2 seats per row) or the train’s length would be shortened (perhaps 4 rows, or 6). 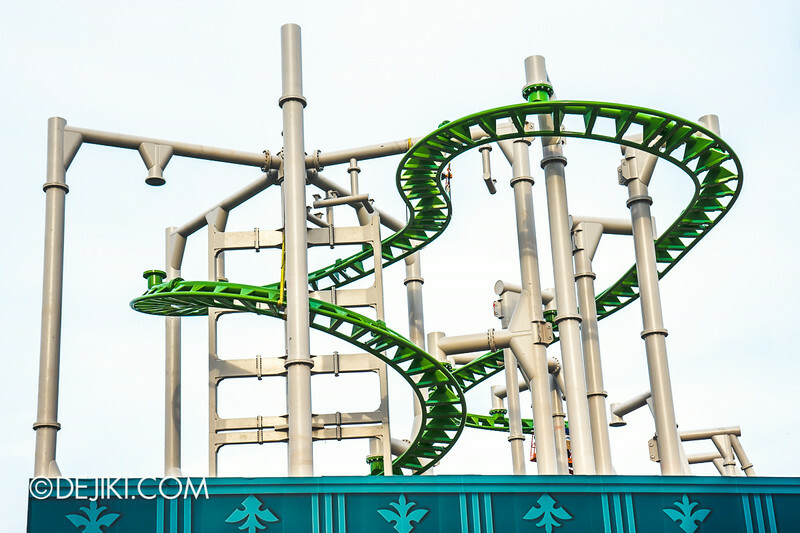 Either way, a lighter roller coaster train would definitely reduce the stress on its mechanical parts. This came in a few weeks ago (but lost in the midst of exciting HHN4 news). 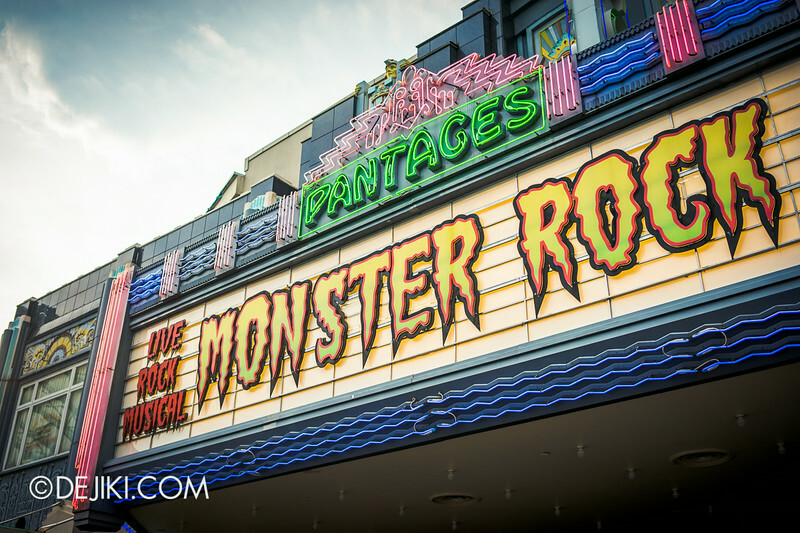 Monster Rock at Pantages Hollywood Theatre will be retiring from the park’s show line-up. The final day of performances will be on 31 August 2014. 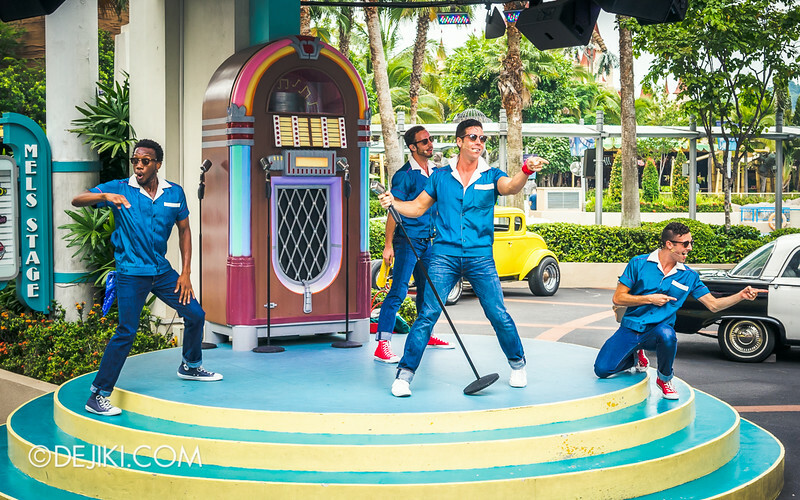 This Rock-and-Roll musical spectacular has been shown at the park since its soft opening days (March 2010) so I’m sure some fans may feel sad to see the show go. Monster Rock: Special Halloween Edition will also not return for HHN4. So don’t wait already – catch Monster Rock as soon as you can – it’ll be a while before the Universal Monsters are brought back from the dead again! Starting from 20 September 2014, Elmo, Big Bird, Cookie Monster, Bert, Ernie, Grover and Abby Cadabby will become the new tenants of Pantages Hollywood Theatre. 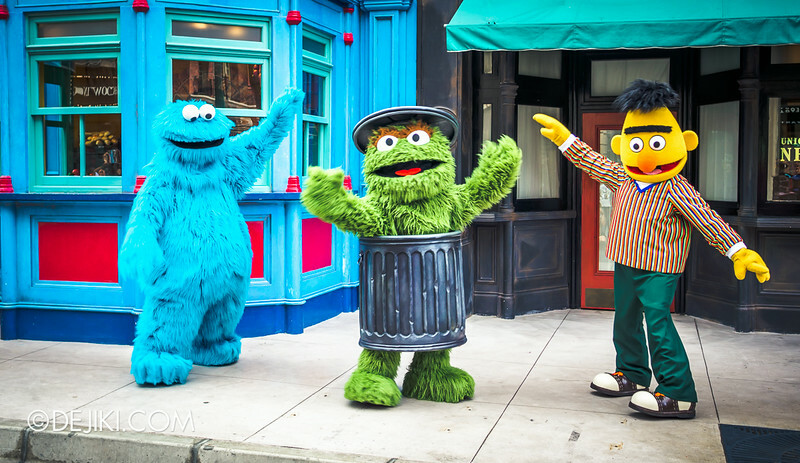 An all-new Sesame Street “When I Grow Up” show, enhanced from the street show performed in New York, will be taking over Monster Rock. There have been some changes to the park over the past two weeks. The latest items are here. 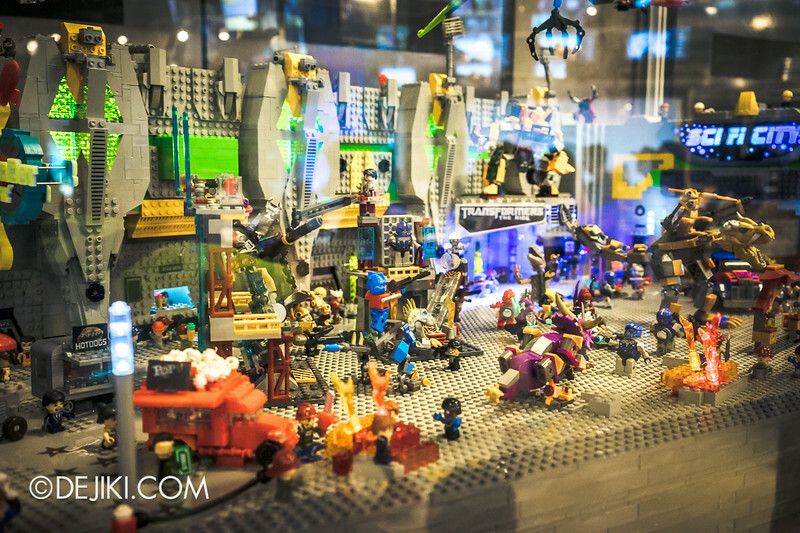 Scroll further down for the first edition of this month’s park update. The covers and scaffolds have all vanished at Battlestar Galactica. 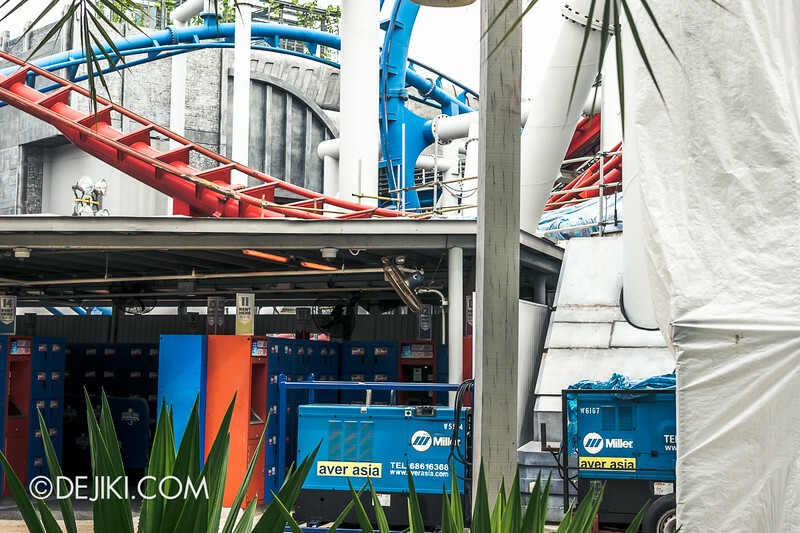 While some machinery are still spotted in the backstage area of the park’s flagship attraction, the dueling roller coasters seem intact. The entrance arch of BSG:HUMAN has some sort of rusty stain all over, though. The tracks’ colours are very inconsistent all over the place due to recent works. But recovering the ride is more pertinent than making it look good. The date draws close to the one year mark – a year of downtime. It would be nice if the park announces some good news on that anniversary. Something like the ride will be reopened by the end of 2014 (or earlier). The latest word is that the ride will indeed have a new identity. For now, we can still wish that it’ll remain as HUMAN vs CYLON. 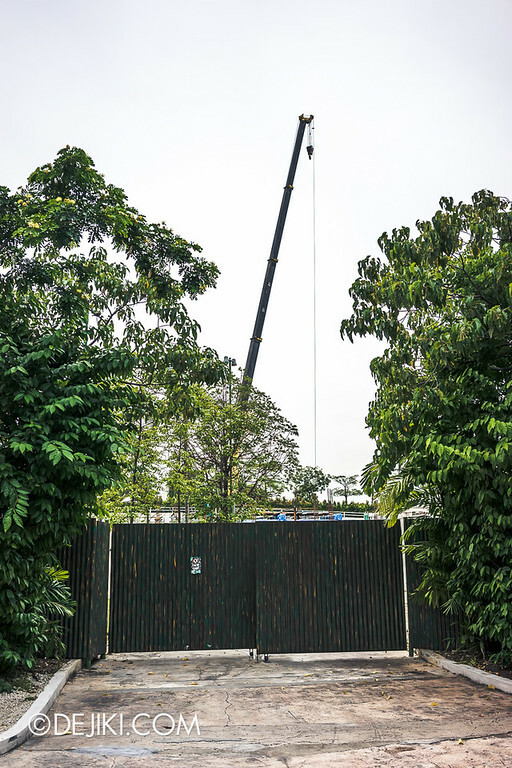 Works have started at the park for this year’s Halloween Horror Nights 4. 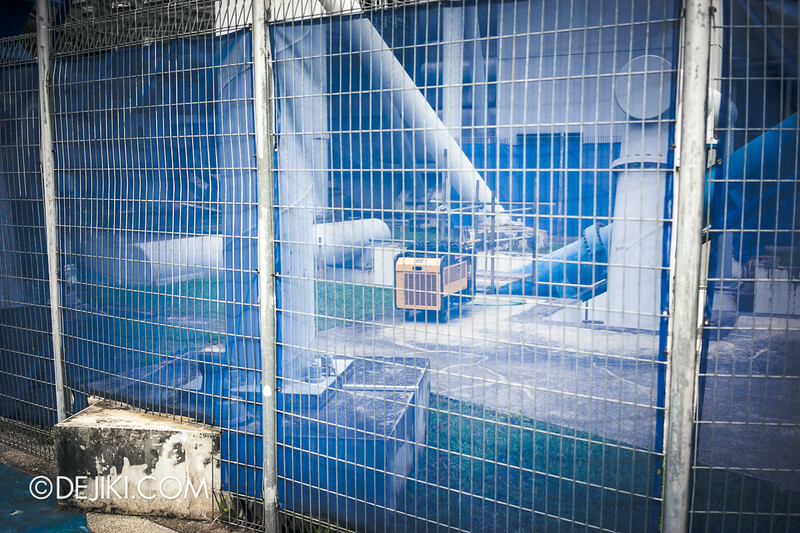 The Waterworld covered queue area has been blocked off for one of this year’s Haunted houses/mazes. 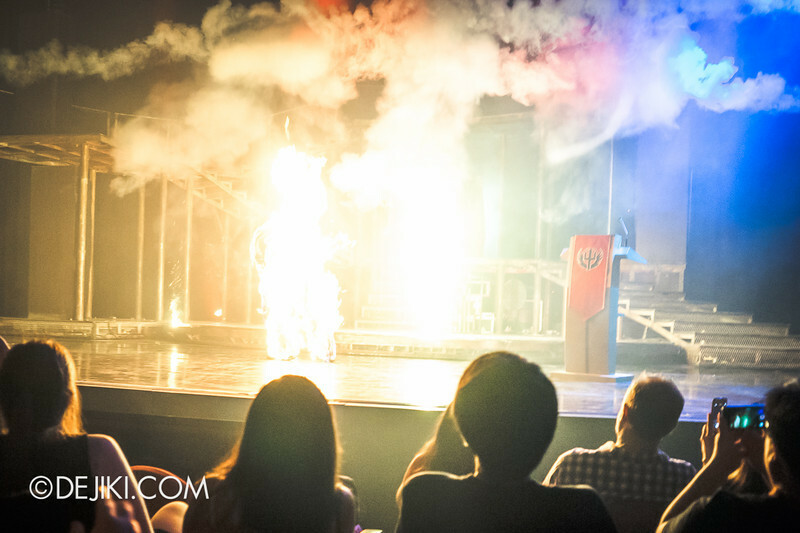 Want to be part of HHN? 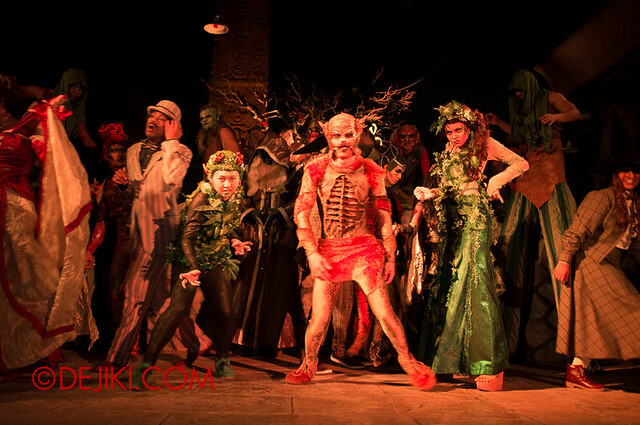 You have one last chance to audition to be a scare actor or special talent! Meanwhile, meet this year’s HHN icon, the newly-elected Minister! 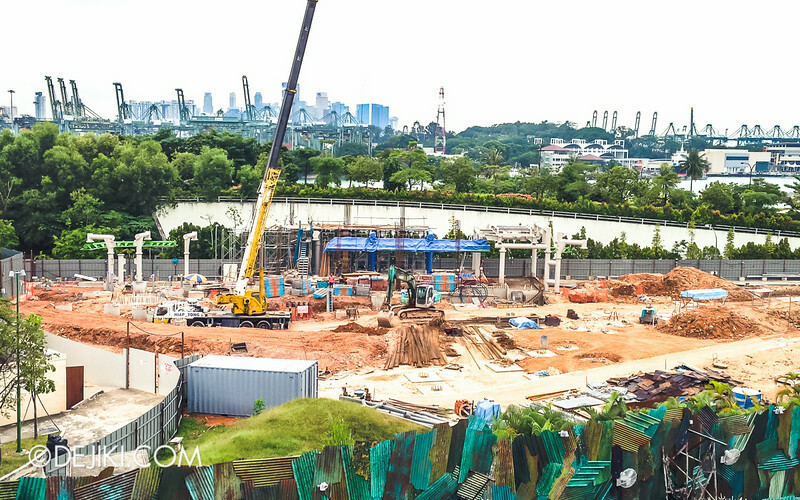 The track support columns for Universal Studios Singapore’s latest attraction is going taller, and taller, at Far Far Away Extension. It is looking rather high. 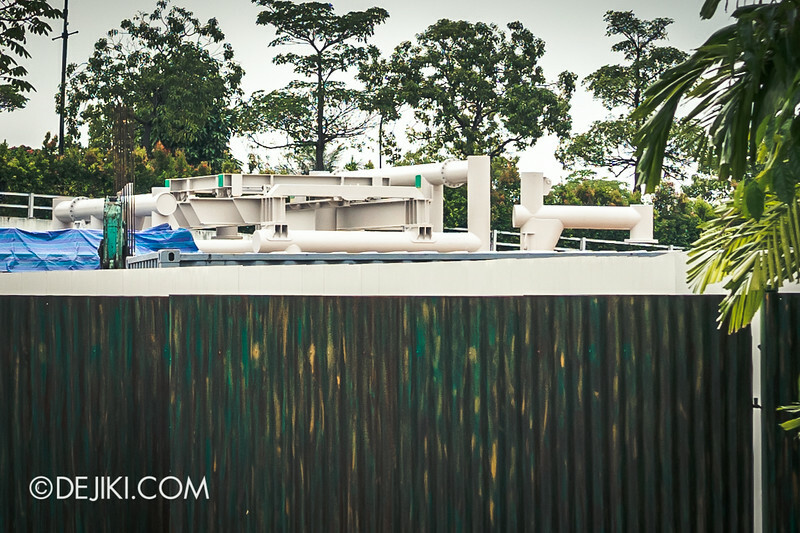 Guests might be able to see the ride from across the lagoon (from New York and Hollywood). 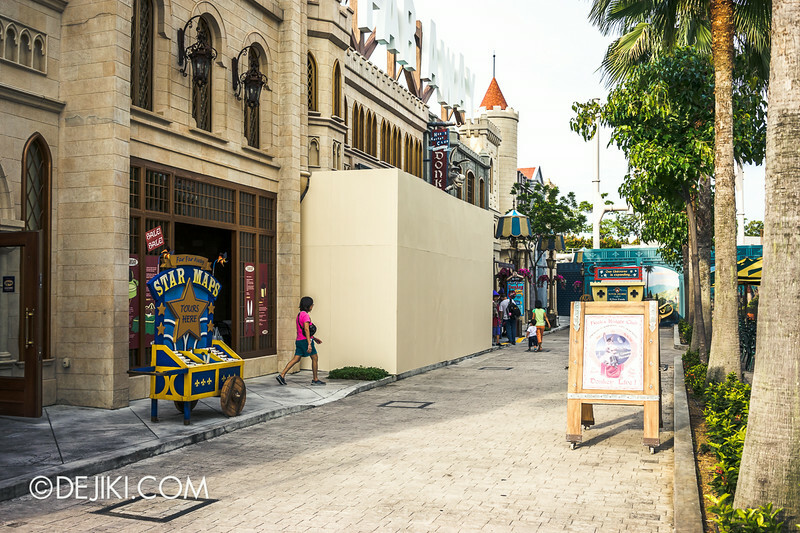 One of the faux store windows at Far Far Away’s Romeo drive has been masked off. This is the popular Versarchery window that parodies Italian fashion house Versace. Curious. The ride is being built so close to Far Far Away that well, it looks unlikely that it would be anything but an extension. 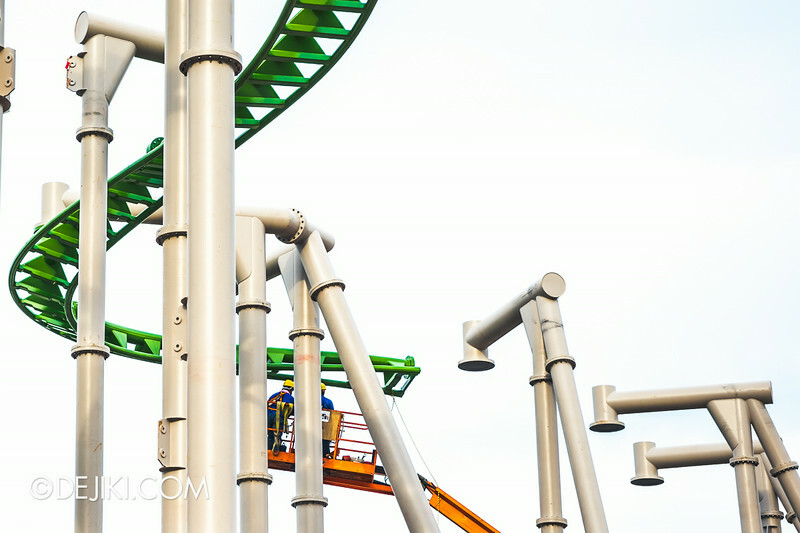 Even more new photos showing the spiral lifthill of this new roller coaster. 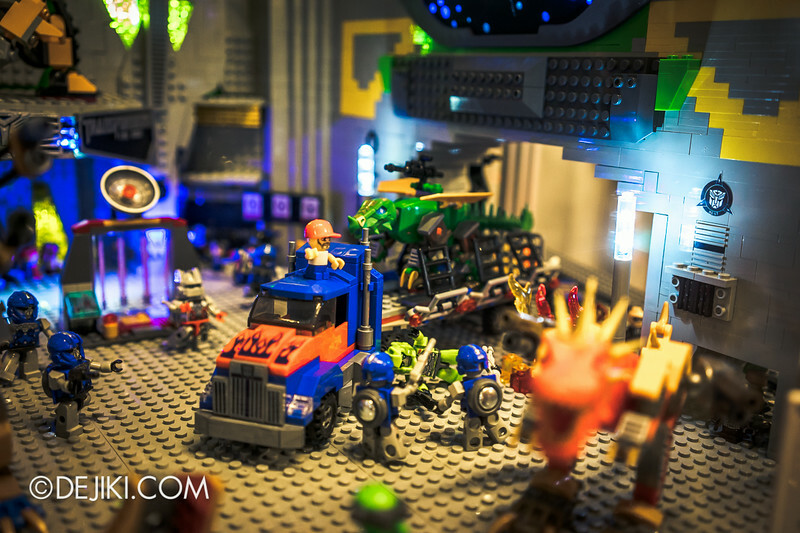 Thanks to WF for sending in these photos! Really cool to see the tracks coming together, huh! Current progress, as of 24 July, showing a completed spiral lift and what seems to be a straight track with some gentle banks. At this point it does not appear to resemble the standard Zamperla Volare coaster (which has a drop shortly after the lift hill). Thanks again, WF, for sending in the photo. 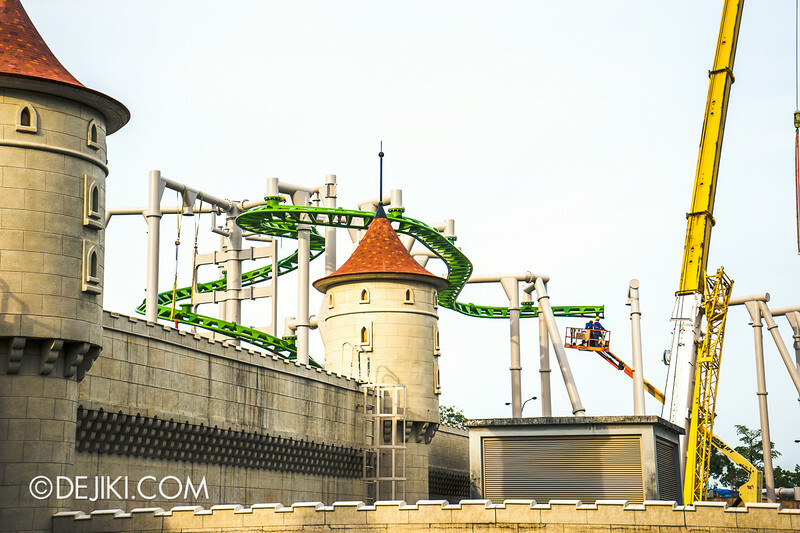 Works at Battlestar Galactica is still ongoing, with no change at the scaffolding setup. 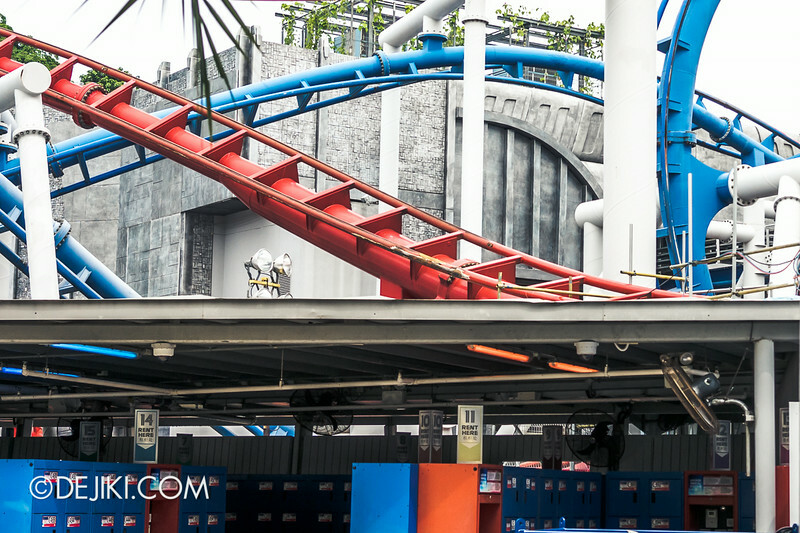 Some machines and tools were spotted at the base of the CYLON (blue track) vertical loop. Work lights, some other heavy equipment were seen at the specific section of HUMAN (red track) as highlighted in the last update. While the timeline is still unclear, certainly repair works are being made at the ride. Thanks to WF for the tip-off on BSG. 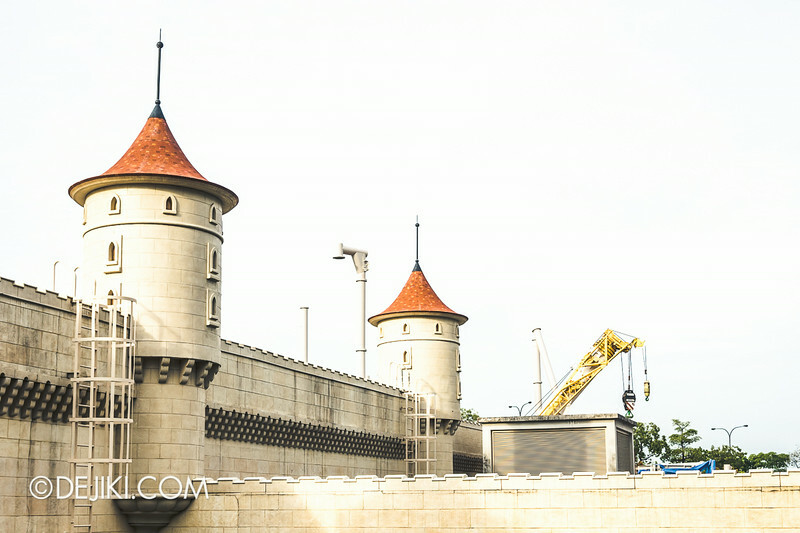 The park expansion and new attraction is still a mystery, but perhaps we will get some concrete information in a few months. Recently, construction went vertical at the work site. Yes, those are track support structures. The new attraction at USS, built at the Far Far Away zone (next to Donkey Live!) is apparently going to be a roller coaster. Given the hints so far, and the type of track used… I guess it could be some form of Suspended Family Coaster by Vekoma (or Zamperla, as noted on TPR). Previous rides built in this category (Suspended Family) uses smaller roller coaster trains that seat 2 guests in a row. It may use similar ride seats and restraints already seen at the park (Battlestar Galactica) but modified to allow younger guests to go on the ride. Designed with families in mind, such roller coasters do not have inversions. It may however have some tilting/swinging elements. I’m not sure how high or fast this ride would go, but I must applaud USS for building another roller coaster, especially a suspended one! 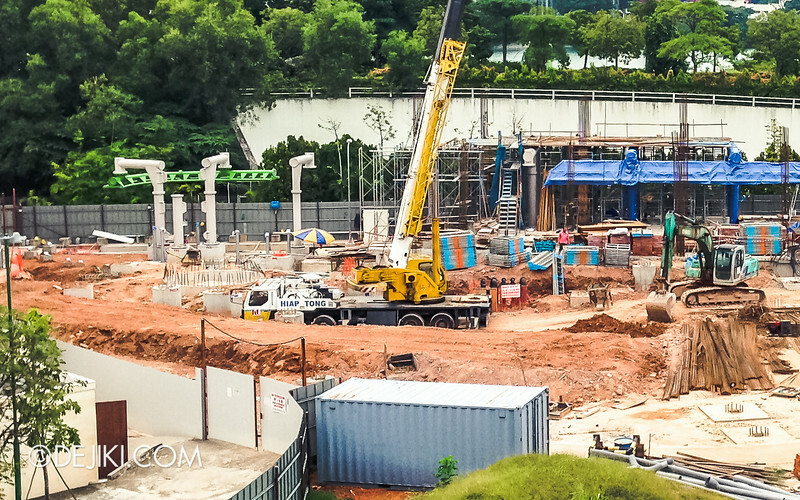 Given the tight space at the expansion site, the track layout should be a custom design, or a heavy modification of one smaller off-shelf ride layouts that the ride manufacturer offers. 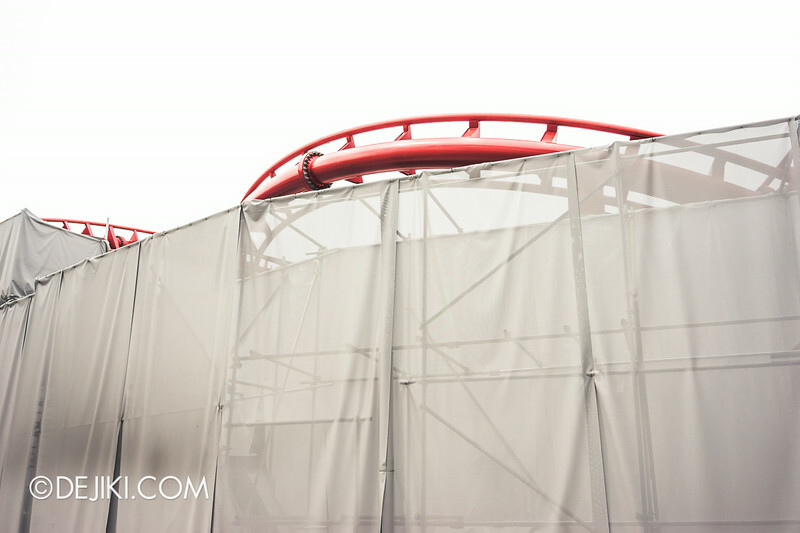 Make a guess on what the ride’s name, and the themed area would be. 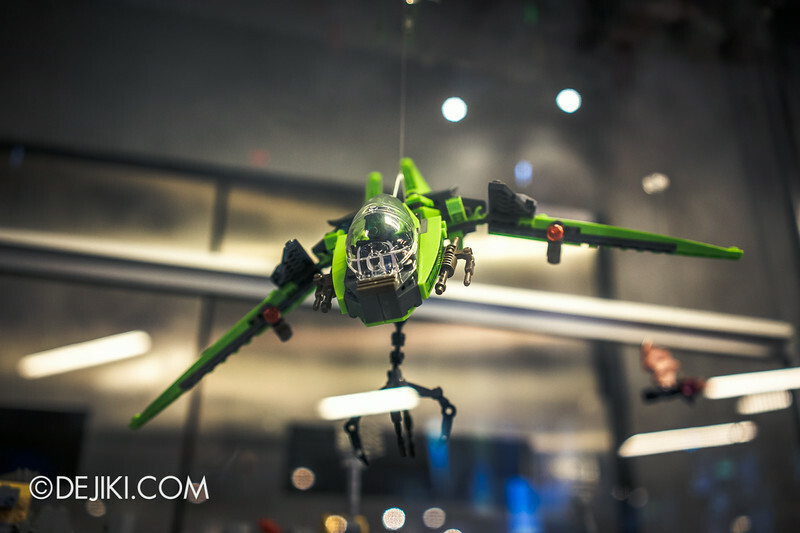 Post your entry by leaving a comment. I’ll give out a prize (a bag of USS park goodies!) to whoever gets it right in the end! The new ride in USS will be called Gingy’s Glider* in an area called Shrek’s Faire Faire Away*. 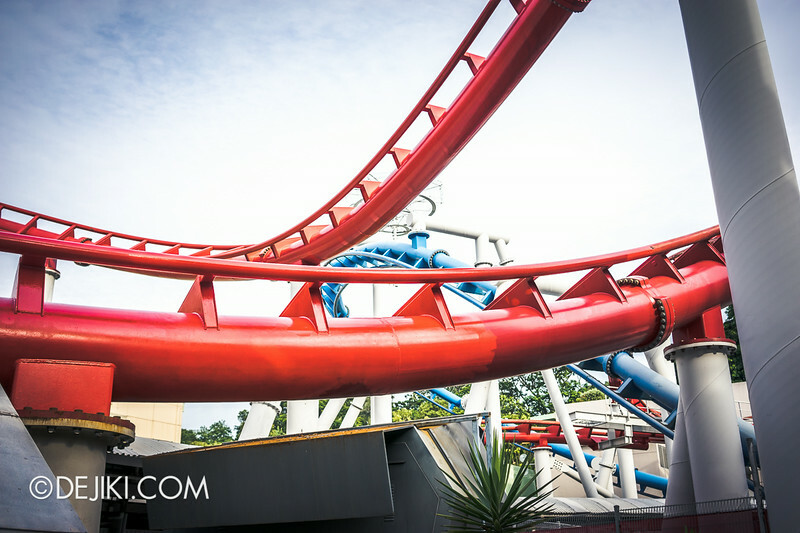 *Trivia: These are real rides and themed zone names found in Dreamworld, Australia! 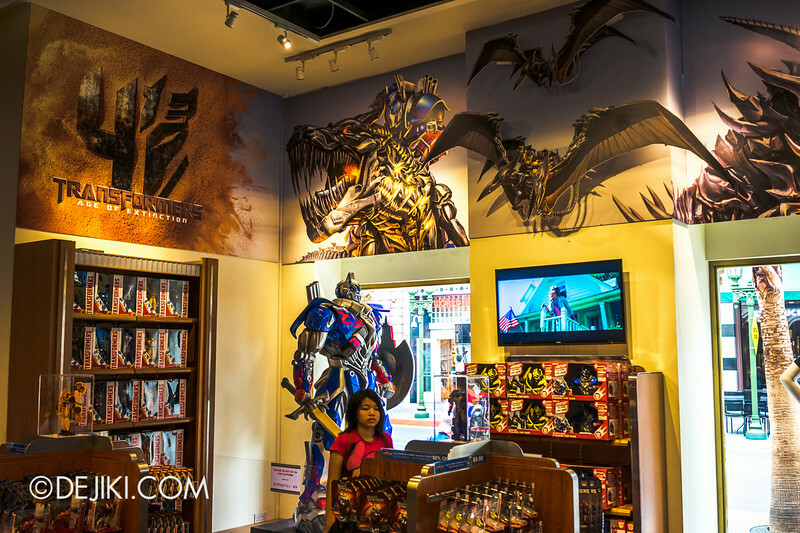 The park celebrated the opening of the new Transformers: Age of Extinction movie with some themed retail spaces. 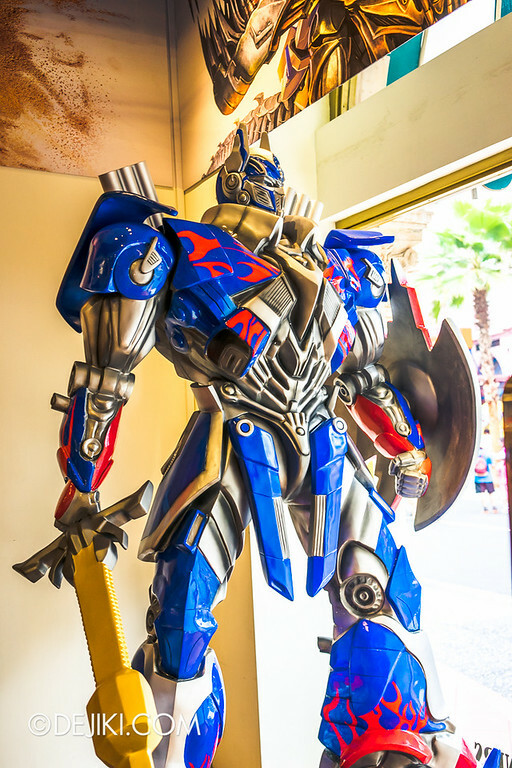 Over at Hollywood zone’s Universal Studios Singapore Store, you can find Optimus Prime gazing majestically at park guests through a store window. 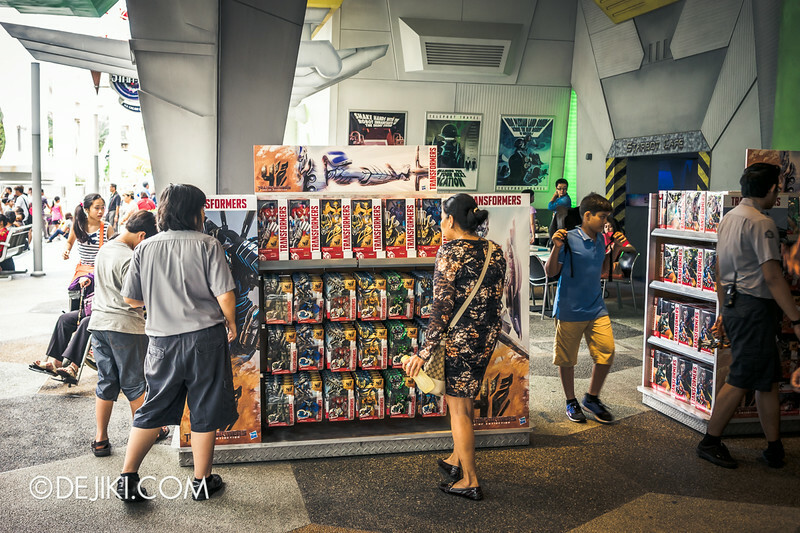 At Sci-Fi City, Transformers Supply Vault has a pop-up section right outside, because there are way too many new toys to buy. 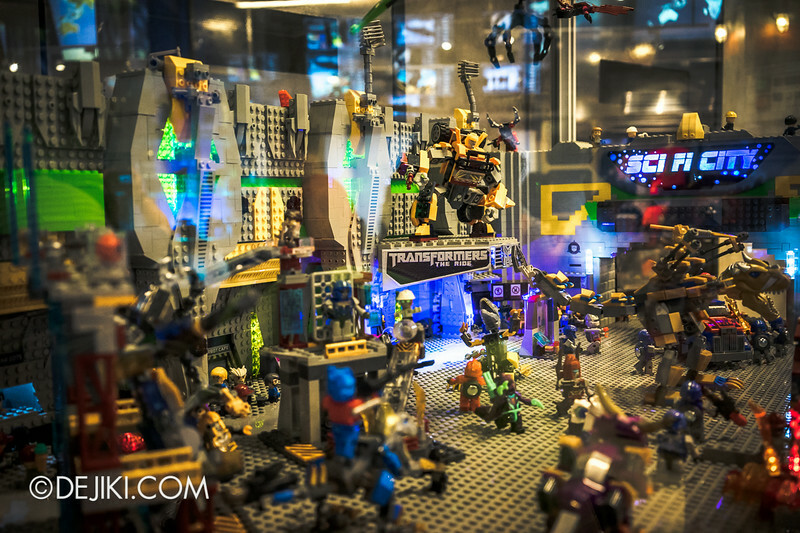 Even if you don’t intend to splurge on the new toys, don’t miss this Sci-Fi City Diorama inside Transformers Supply Vault. 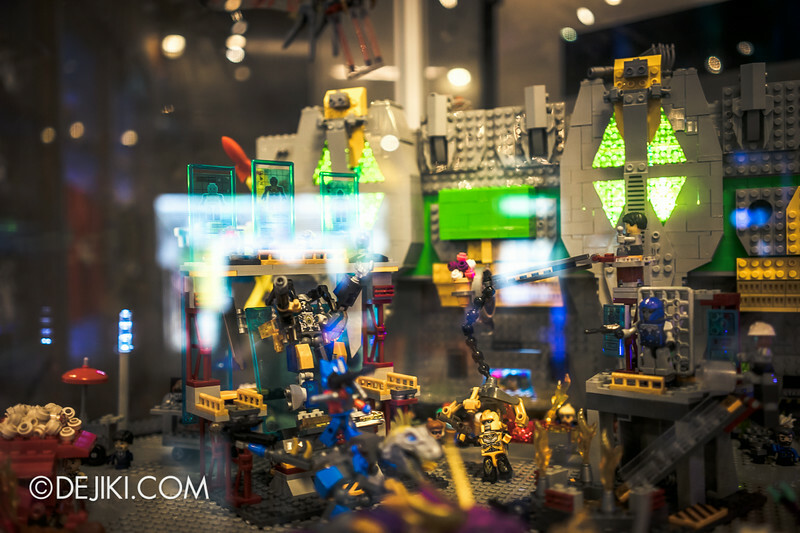 Made with KRE-O bricks and Transformers toys, this is certainly an exciting scene of Sci-Fi City being overrun with robots. The attention to detail is really commendable. 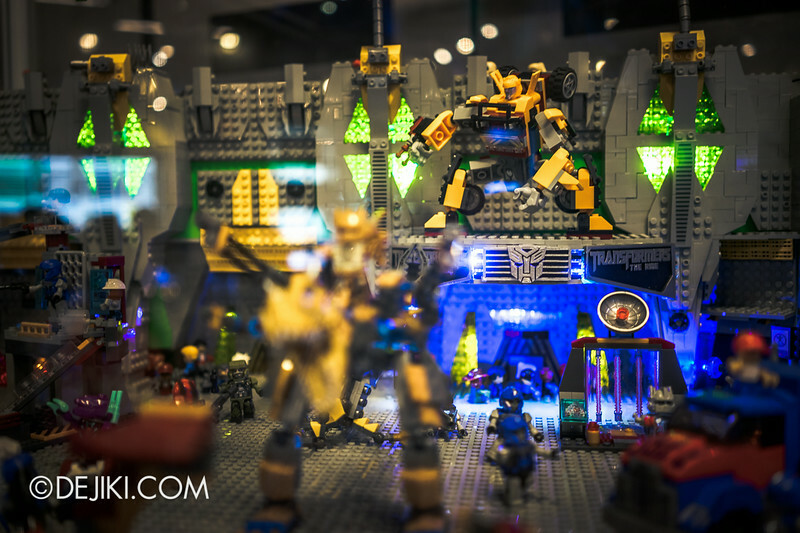 Even the Bumblebee at the Transformers ride marquee is posed as closed as the life-sized one outside. Except for this “Hong Kong” sign, which is totally random. 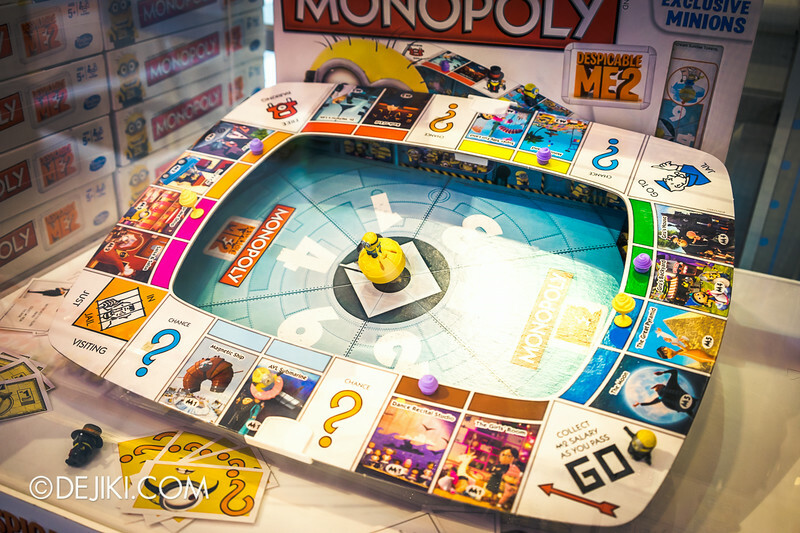 Wonder how the Despicable Me Minion Monopoly looks like? 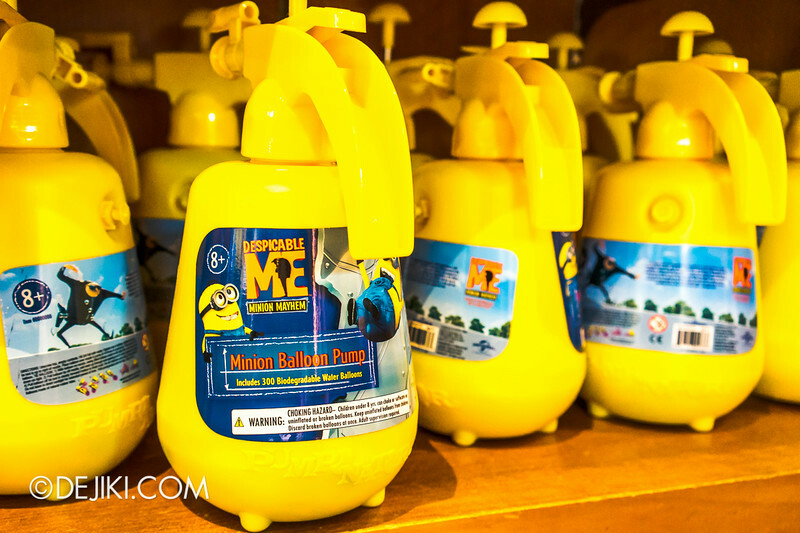 The park has put together a display set at Minion Mart. 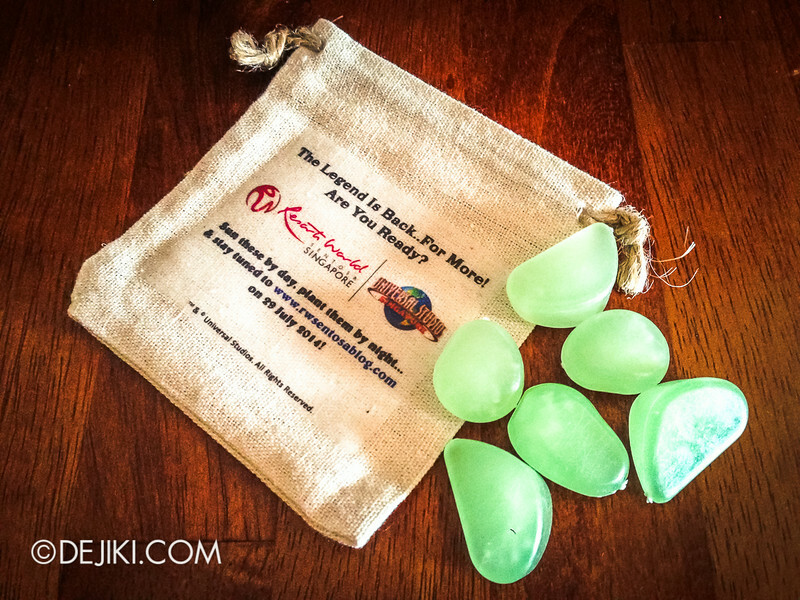 Need a roomy bag for sundries? 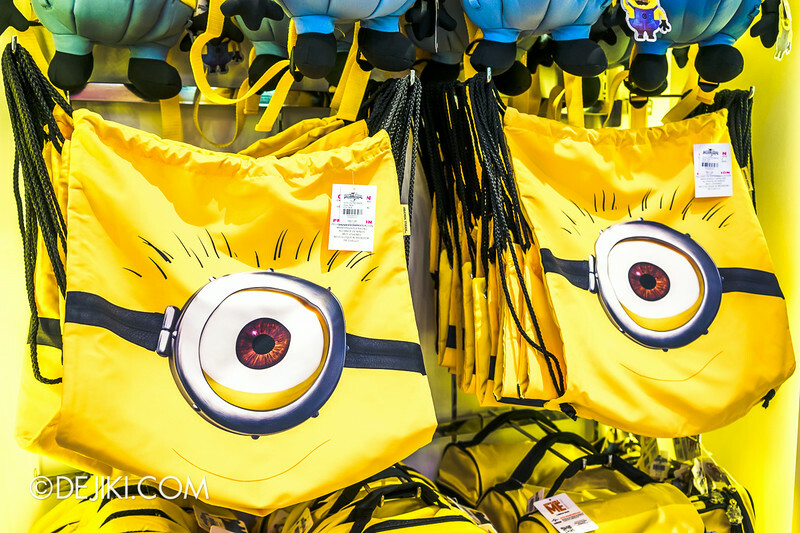 Grab one of these Minion Drawstring bags for $21.90. It’s so bright and loud, you’ll never forget it. For more details, refer to the official Auditions page. 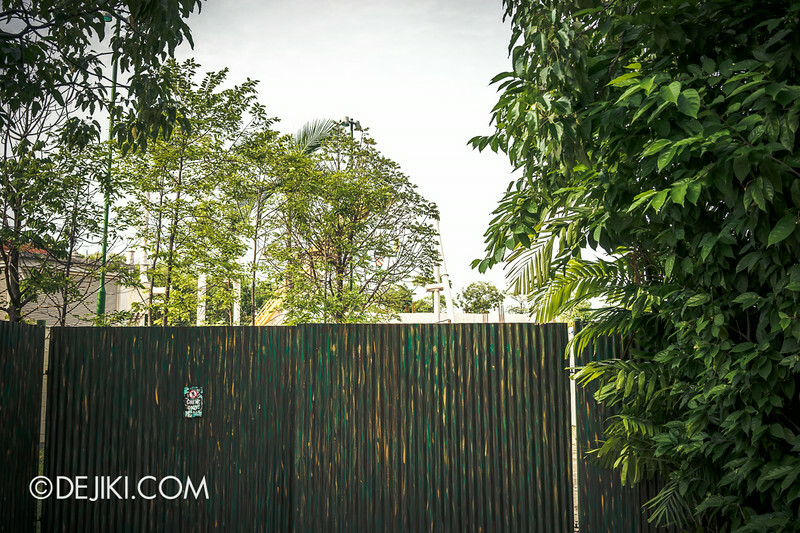 Once again, you can check out my Halloween Horror Nights archives to learn about Halloween Horror Nights in Singapore. 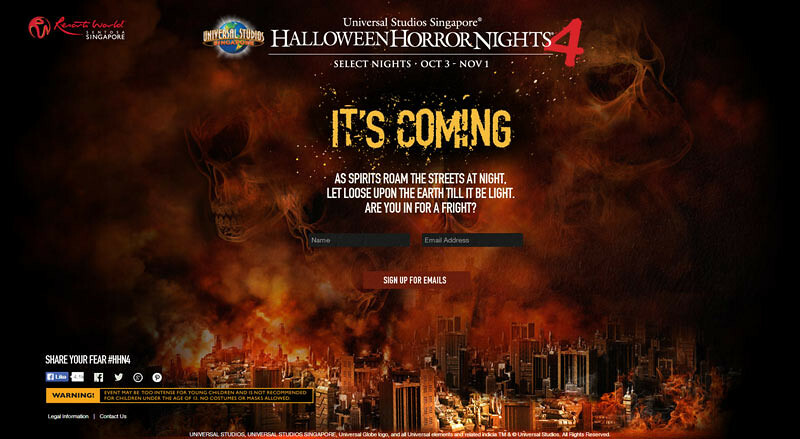 The Halloween Horror Nights 4 website had a teaser image of a burning city, with images of haunting skulls rising from the smoke. 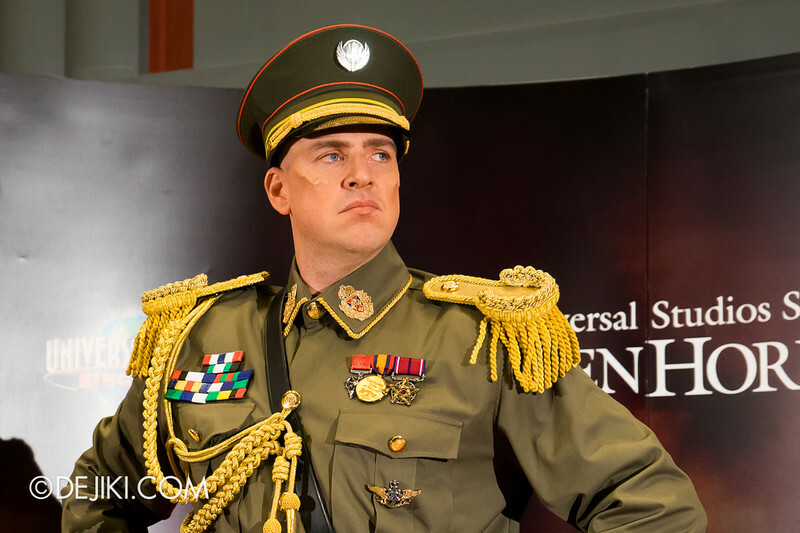 On 11 July, it was unveiled that Jonah Goodwill, a well-decorated military commander, would become The Minister – this year’s icon for Halloween Horror Nights 4 Singapore. Sounds exciting. 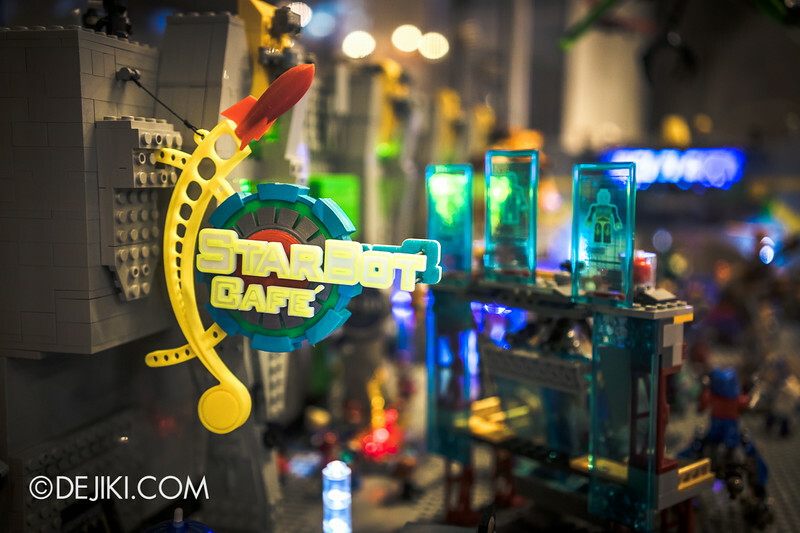 Also, you can now sign up for email notifications of the park’s best event! Great update! I am not in Singapore right now so I am missing all these happenings in the park! It is such a delight to see that the new attraction is a “Ride” instead of a “Show”. I have certainly not foreseen that it could be a roller coaster. So excited to see how this will turn out. I do hope the tracks to be enclosed in a show building, or at least partially, so that there is a hybrid attraction of roller coaster and dark ride. 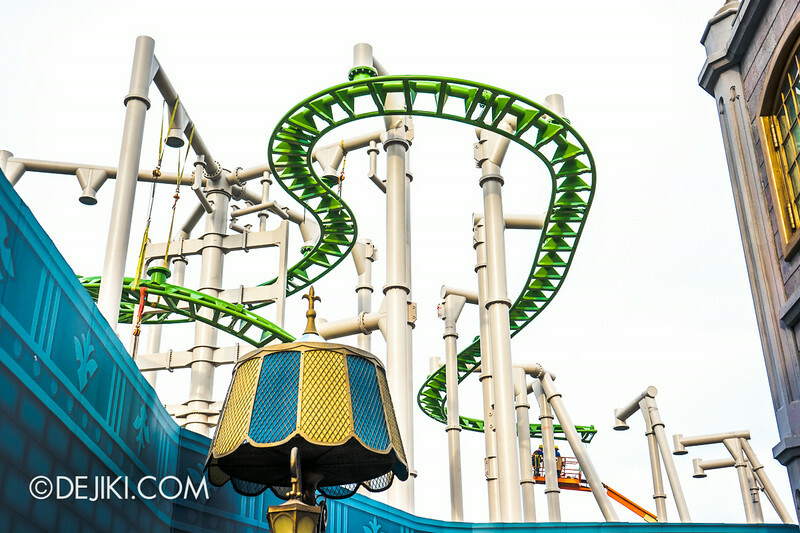 A hybrid coaster would be a nice idea – I completely agree with you. It’s difficult to tell…Perhaps if we wait for a few more weeks we will have a much clearer idea. 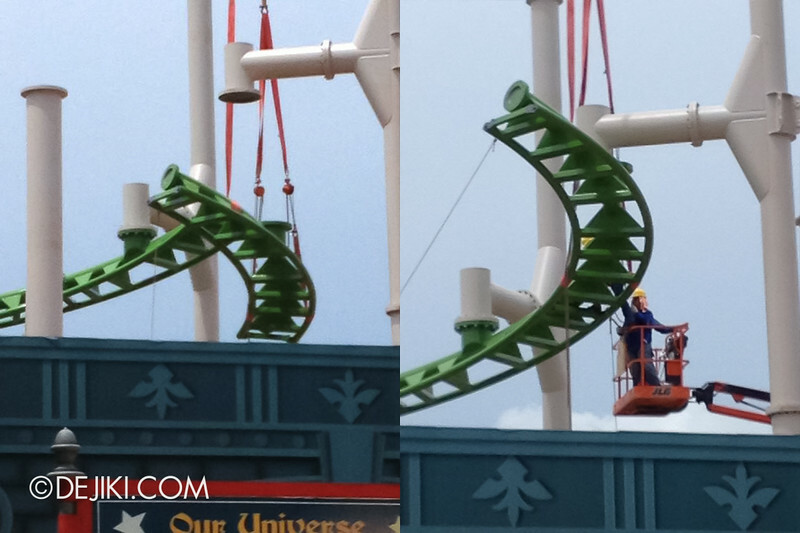 Green tracks, I would guess Hulk coaster but it’s at the far far away area so probably not . Probably “escape form lord farquaad” or something haha . Thanks for the monthly updates! I would hope that it will be a simpler version of Wizarding World of Harry Potter or at least to satisfy HP fans, a ride dedicated for Harry Potter. Definitely no C-grade ride please. Dejiki, any idea when this ride is due for completion? Mid 2015? Any suggestion the new coaster could be connected to waterworld instead of far far away? I was guessing something to do with Shrek’s swamp, but Shrek’s home is located nearer the Madagscar area… Unless they relocate it? Could it be Puss in Boots-themed though? Wonder if Kitty Softpaws from the Puss in Boots movie will start making appearances if that really happens. That Includes “Kitty Softpaws” mascot I presume? Yup! There are several characters at other Universal parks I’d like to see, including Lucy Ricardo and Count Dracula. I know Dracula is in the parade with Bride of Frankenstein but I’d like to meet them! If only there are “Adult Bumper Cars” in the new zone! Anyway, I hope the new roller coaster is not as scary as Revenge of the Mummy and Battlestar Galatica (BSG is closed), but also not too simple as well like the recent new attraction Sesame Street. Adult Bumper Cars? 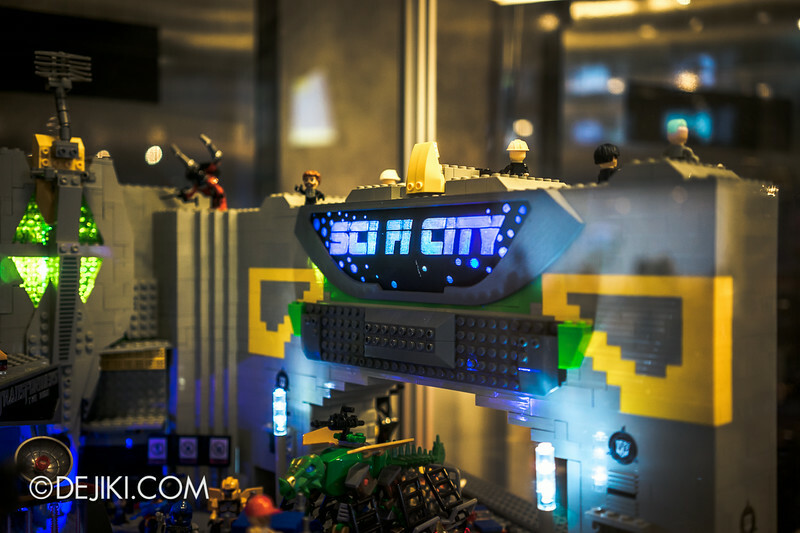 Interesting… any movie theme in mind? 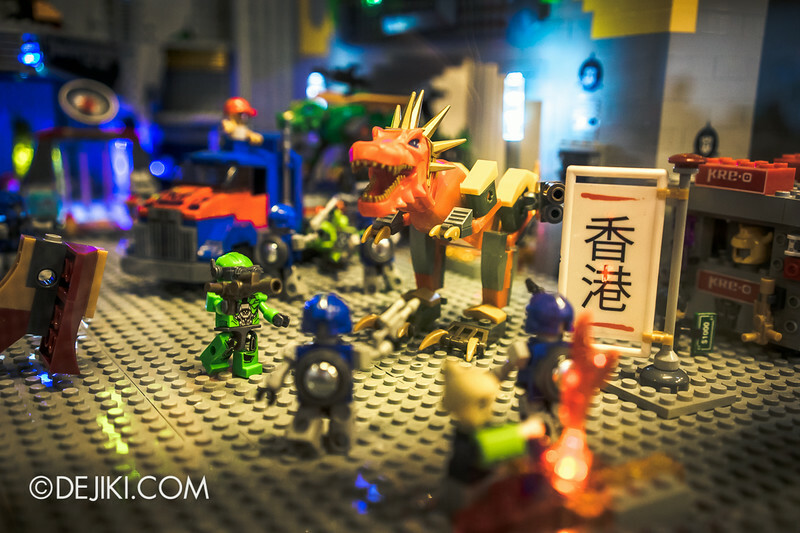 Maybe it will be themed to Kung Fu Panda? I know they had intention to do something with that film when the park first opened, and that would be marketable and unique. Could it be a King Kong themed ride? 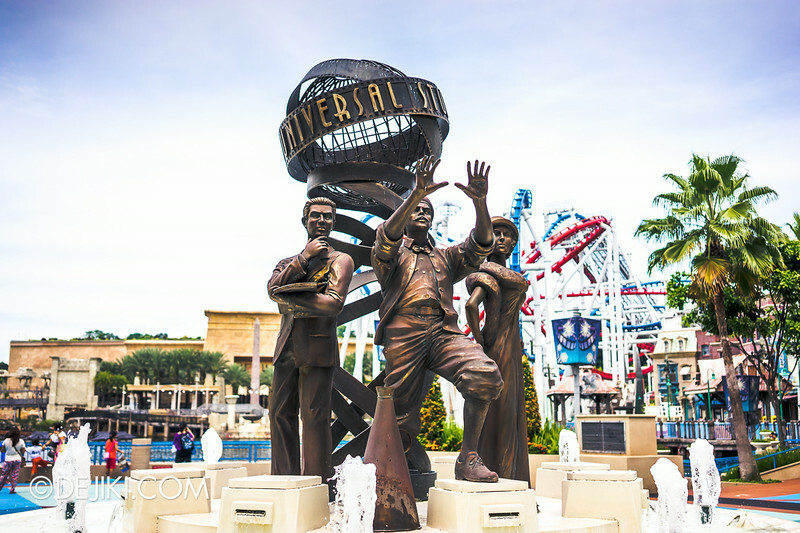 It’s rumoured that they are working on a Kong themed ride at Islands of Adventure in Orlando so maybe they are doing something similar in USS. Whatever the theme I am sure it will be exceptionally executed and I am just glad to see another coaster even if it is to be aimed at families. 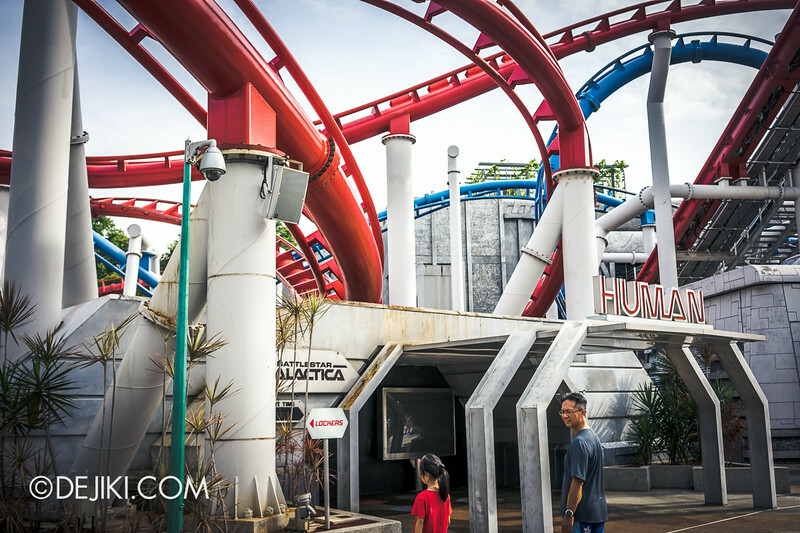 Glad the Battlestar Galactica coasters are finally been worked on as well! Could it be a King Kong themed coaster? They are rumoured to be building a Kong themed ride at Islands of Adventure in Orlando. Whatever the theming I am sure it is going to be amazing. Glad to see that it is a coaster being built even if it is aimed at families. Also really happy to see they are finally sorting out the Battlestar Galactica coasters! Hi. 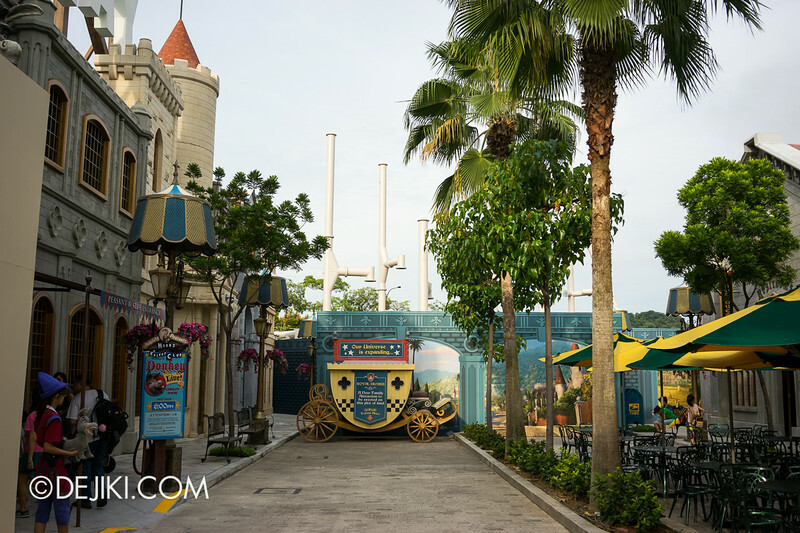 The new ride in USS will be called ‘ puss in the boots with three blind mice’ at far far away zone. Guys, this is made by Zamperla and it will be themed to Puss in Boots. 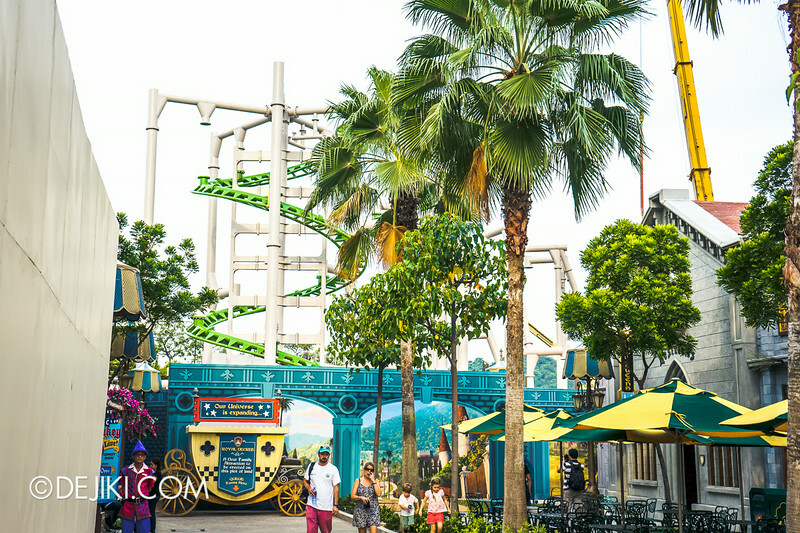 It was posted on ThemeParkReview, you can check the Universal Studios Singapore Discussion Thread and head to the last page. Scroll a bit and you will see it. Cheers! Woah it’s exciting to see so many updates at the park within such a short period. Wah another new ride coming from Far Far Away that sound great. I am sure it must be the from the Shrek theme. I guess it should be the Puss and Boots theme. Since there have already Shrek 4D, Donkey Live Show and the Ferry wheel inside the Castle so the next theme should be Puss and Boots. Me and my friend will come to USS in this August and I’m really worry that Transformer 4D and The revenge of mummy still close. Anybody can confirm me about this please? You might have the wrong info. That two rides are not closed. Hi, may I know where did you get all the photos? Especially the ones that seem to be taken from an “insider”? Really worried about the ride capacity. 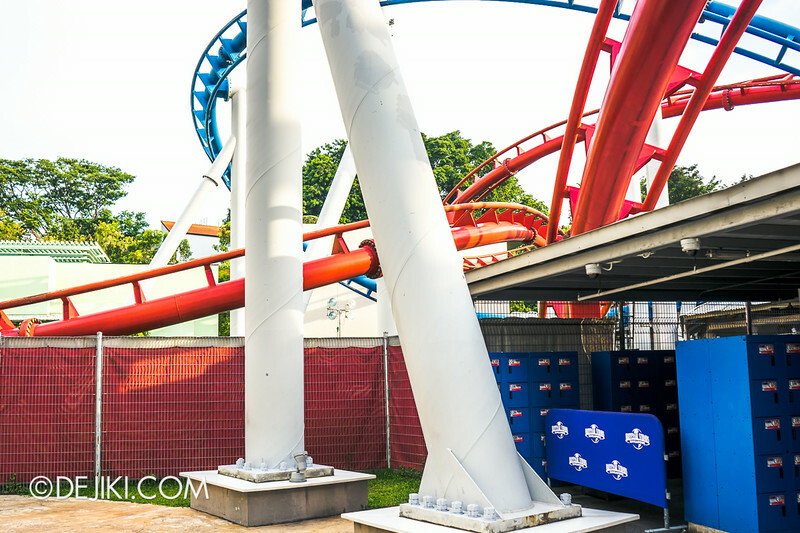 Hope they are able to dispatch more coasters than the typical ‘zamperla volare’ coasters. I agree too. This is why I prefer indoor rides. Though I’ve watched Monster Rock a few times and mostly know the set list in order by now, I’m interested to see what will come to the theater after HHN4. Any idea? At the moment, it is likely that the new Sesame Street stage show will resume its run at Pantages Hollywood Theatre after HHN4. 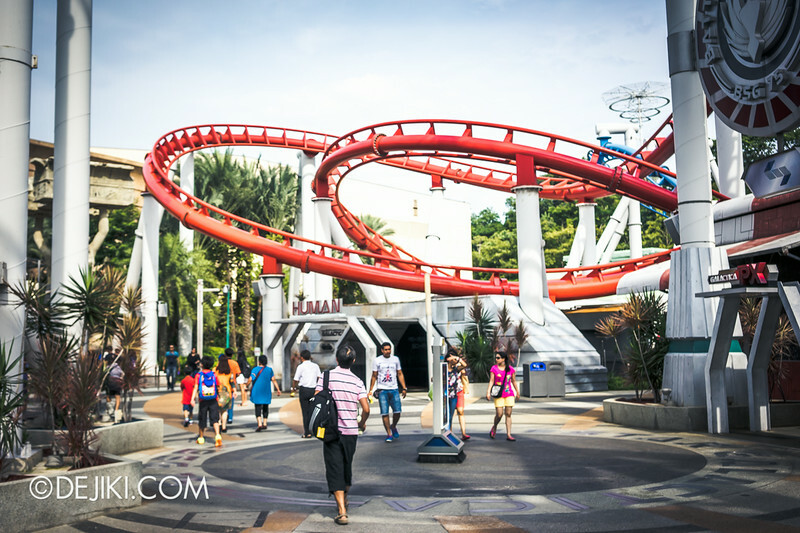 Finally something new, something fresh, something to look forward to at USS. That area could be “Puss In Boots” and “Kitty Softpaws” new stage show starting September 2014! Hi Zezima, Thanks for sending in all your sources and comments! That sounds possible. Maybe the new show shares the same stage as Donkey Live. I was wondering if Sept still have the magic beans ..?